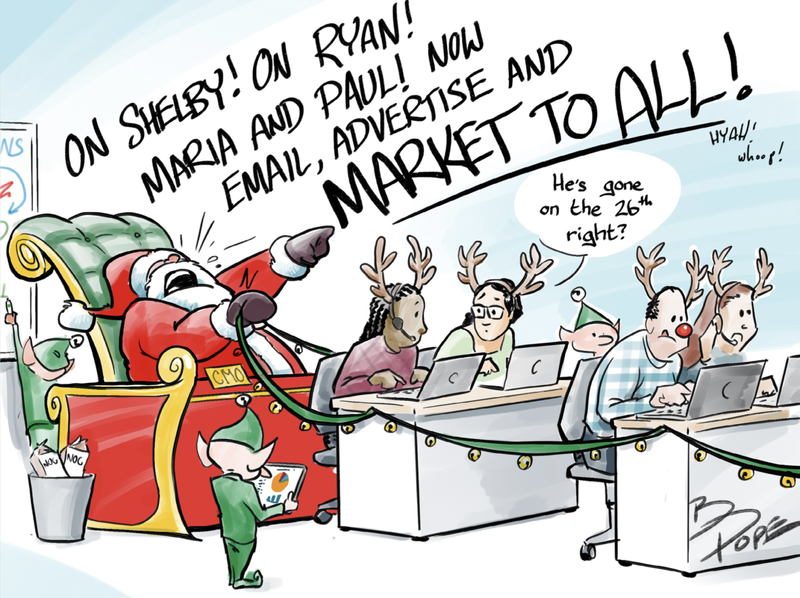 Do you become a different marketer during the holiday season? Until holiday season begins, you spend countless hours researching your audiences, building buyer personas, and executing strategies that put the customer’s experience first. All of your work is rooted in best practice and conducted with an innovative spirit. I mean, let’s be honest, you’re really good at this. Then, out of nowhere, the holiday marketing season takes hold. Grab your copy of “Delete Santa: Holiday Marketing Nightmares Revealed” now. All of those best practices and innovative, creative ideas take a backseat to what needs to be done for the final push before year’s end. We don’t act like ourselves. We send multiple emails daily. We execute a variety of promotional ideas we would never consider in Q2. We try to tailor our messages in ways we aren’t quite ready to do. The result is a marketing tsunami that results in a lot of noise and a bunch of tired marketing professionals. Here’s the thing: we know we aren’t ourselves during the holidays. And it makes sense why we act the way we do in the final quarter of the year. According to a National Retail Foundation survey, consumers will spend 4.1 percent more during the holiday season this year than they did a year ago, for a total of $720 billion. This year, we decided to ask a group of marketers what they think of the profession’s approach during the holiday season. We partnered with our great friends at Oracle Marketing Cloud and surveyed more than 400 seasoned marketers across the U.S. We asked them what they like and dislike most about the holiday marketing season. The answers we received were revealing, candid and funny. We took our survey responses and developed a set of hilarious, spot-on cartoons that illustrate how marketers feel about Q4 activities. 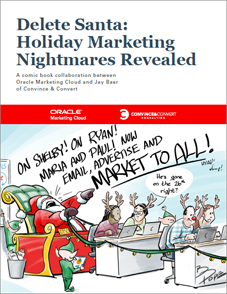 We want you to grab an eggnog (spiked, of course) and download “Holiday Marketing Nightmares Revealed” now. In the meantime, here’s a summary of the top 4 most annoying things about holiday marketing, according to marketers. Taking the top spot for biggest holiday annoyance is holiday campaigns that coincide with back-to-school shopping. Sixty-three percent of marketers say it drives them nuts when they see a holiday marketing campaign in full flux right before Labor Day or just before March Madness. We believe there’s a window when it’s appropriate to do holiday marketing even though we don’t necessarily abide by that window. During the five-day period from Thanksgiving to Cyber Monday, 70% of Americans shop. Black Friday is the busiest shopping day during this period, with almost 115 million shoppers. Perhaps, it’s because we know this fact that we get a little carried away. Marketers’ second top holiday annoyance is the practice of creating sales and promotions for Black Friday or Cyber Monday that are so hot they induce consumer stress. 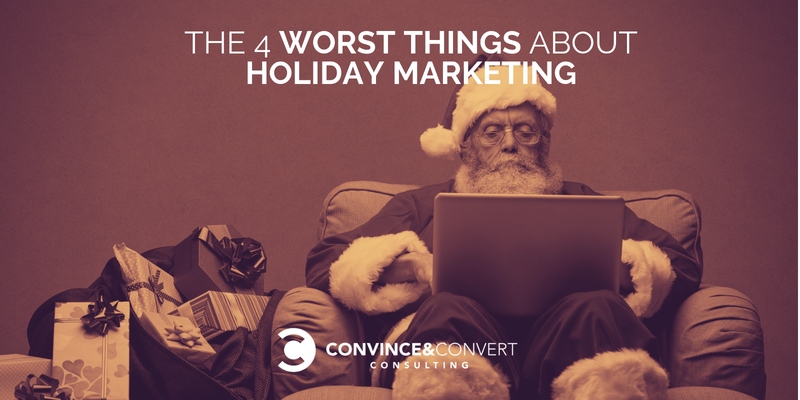 The third top frustration marketers have is using the holidays as a justification to send more emails. Nearly half of marketers said this practice got under their skin. Interestingly, while some survey respondents claim we abuse email during the holiday marketing season, others say it’s justified and consumer behavior data backs the increase. This is the most interesting result our survey revealed. According to survey respondents, more than half of marketers believe it’s time to retire the Christmas poem, A Visit from St. Nicholas. Sixty percent of us are bothered by campaigns that use phrases from this poem and believe t’was time we looked to other sources for creative holiday inspiration. There is plenty more we do during the holiday season that we wouldn’t do any other time of year. All of those ideas have been illustrated for you to enjoy in this ebook now.